1.1.5 Amanada and Anthoney make it to Paris! 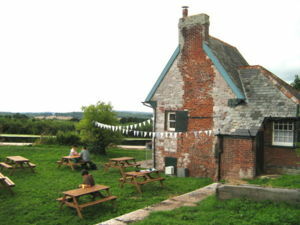 A new cafe has opened at Topsham Lock on the Exeter Ship Canal. 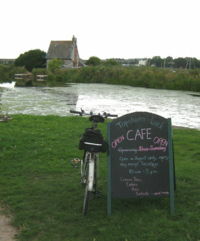 The cafe is open in August only, every day except Tuesdays, 10am - 5pm. See their website for details. The final planning application for the Exe Estuary Trail is being considered by planners. The planning application is for "Odhams Link", shown in green on the map. Full details are available on the Devon CC website. Completion is programmed for the current financial year and will mark the completion of the Estuary Trail from Darts Farm to Exmouth. 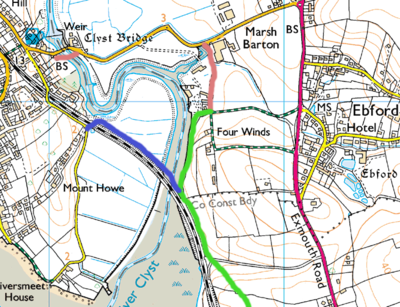 Meanwhile, funding for the Clyst Bridge, shown in blue on the map, is still to be allocated and is likely to be at least 2012, due to the high cost. 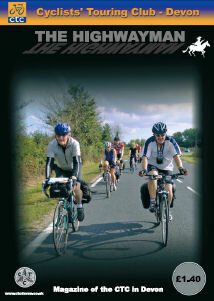 A reminder that the subscription year for the Highwayman Magazine runs from from October to September next year. A subscription form can be downloaded here. Note that reduced rates are available for OAPs and for collection by hand (e.g. on Coffee Pot Rides). For those not familar with the magazine a sample copy is available on-line. Ten issues are published each year and each issue contains reports of recent Runs as well as News, Touring and General Articles. Enclosed with each issue is a convenient list of planned rides and events for the next 6 weeks. 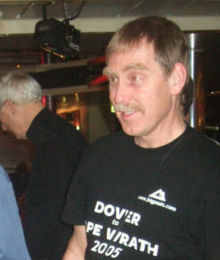 On 21st June Graham Brodie completed his cycle right around the UK to raise money for Shelter Box. Graham covered about 2,625 miles at an average rate of 90 miles per day, with climbing in excess of 100,000 feet. Click here for further details of his route and blog. If you would like to support Graham's efforts please visit his Justgiving web site. Amanada and Anthoney make it to Paris! Over the last twelve months Amanda Denham and Anthoney Strowger have been training hard for a charity cycle ride to Paris. Their training was interrupted by a nasty fall on ice in December and included salsa dancing combined with a challenging ride round Brittany in May (yes both at the same time!). 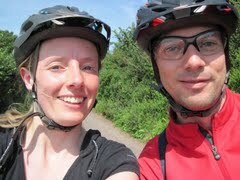 Last week they successfully cycled from London to Paris ... and recorded events (in some detail!) on their blog. Well done Amanda and Anthoney. Devon County Council won a national award for cycling improvements at the transport “Oscars” on 15 July. Devon County Council are organising a series of two hour, guided leisure rides over the summer. The rides are based around five locations - Exeter, Barnstaple, Exmouth, Tavistock and Newton Abbot. Participants can use their own bike - or if pre-booked - can hire a bike for free. The Exmouth, Exmouth and Newton Abbot rides are on the following dates. More information on the rides and details of how to book are available on the Cycle Devon web site. "The Great Tour" is aiming to circumnavigate Britain in 64 days, starting and finishing in Seaton. Its now heading for home down the west side of Scotland. Click here for details. 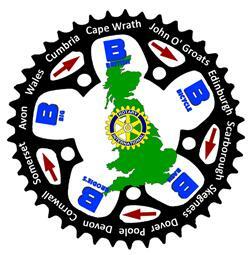 Exeter CTC and Axe Valley Pedallers are joining the Great Tour on the last leg from Exmouth to Seaton on Saturday 4th September. Details will be published soon on our rides list. Click here for details. The Tour of Britain comes to Devon on 14th and 15th September. On Tuesday 14th September Stage 4 runs 171km from Minehead to Teignmouth, including a 1st category climb up Peak Hill in Sidmouth. The ride continues through Woodbury, Countess Wear and Dawlish to finish on Teignmouth seafront. On Wednesday 15th September Stage 5 runs 176km from Tavistock, over Dartmoor, Tedburn St Mary, Whitestone Hill, Cowley Bridge, Stoke Cannon, Bradninch and Cullompton, with a climb onto the Blackdowns from Hemyock. The route then flattens out to finish at Glastonbury. The Family Ride is a one mile circuit of quiet roads in Teignmouth, crossing the same finishing line on the Sea Front as the professionals the following week. The Pro Ride follows the full 171km of Stage 4 of the Tour, from Minehead to Teignmouth. The Challenge Ride follows 70km of the route from Honiton to Teignmouth. On Sunday 26 September a series of Pedal It Pink rides will be taking place from Exeter Quay to raise money for the Breast Cancer Campaign. Participants will be able to chose to cycle a marathon (11:45 start), a half-marathon (12:00 start) or 5 km (11:30 start) to help to raise money for innovative world-class research. Ladies will be able to enter any of the events ... but men are restricted to the 5 km ride. Work has started on a Toucan Crossing of Sidmouth Road at the junction with Clyst Road (at the site of the "Agricultural Crossing"). This is a popular commuter route from Clyst St Mary, past the Blue Ball towards Exeter. The new crossing is due to open at the end of October. If construction work should obstruct cyclists in any way please email Devon County Council. The complete route from Exmouth to Exton is now open. See above for details of the remaining section to Topsham. Please note that the only way to cycle from Exton to Topsham at present is along the busy A376. An alternative is to cycle alomg the shared use pavement from the traffic lights alongside the old Ebford hotel ... and then to walk the narrow section past the petrol station which is any case is not shared use. Work expected to start on site next year. Work expected to start on this path through the fields next year. This page was last edited on 13 August 2010, at 03:20.